33 drivers. 500 miles. One cold bottle of milk and the sweetest kiss of any driver’s career. This is the 103rd Indianapolis 500. This is May. Buy your tickets now for “The Greatest Spectacle in Racing” and make plans for magic and memories. Is it May yet? Find and reserve your seats for the Indy 500 today before they’re gone! Each seat offers you a unique experience and breathtaking action that only the Indianapolis Motor Speedway can deliver. The most affordable way to enjoy the Indy 500 is with General Admission. Enjoy the race from numerous available locations within the Indianapolis Motor Speedway infield. Don’t forget children 15 & under are free with a paid Adult General Admission ticketholder. Can’t decide on which day to come out to the Indianapolis Motor Speedway? Well how about all of them! The Bronze Badge grants you access to every day in May excluding Race Days. It also grants you access into the world famous Gasoline Alley to interact with drivers, see the cars and much more! The Turn 3 Club offers a premium, all-inclusive Race Day experience for The Greatest Spectacle in Racing. Complete with spectacular views, all-inclusive food and beverages, premium beverage options and much more. The Hulman Terrace Club features fantastic views of the front straightaway and unmatched services for you and your guests. Enjoy world-class food, premium beverage options and more in our air-conditioned indoor pavilion or covered outdoor deck and bar. Racing and rock and roll are partners in the perfect party during the Miller Lite Carb Day on Friday, May 24 at IMS! Join all your friends on one of the best days of the year at the Indianapolis Motor Speedway. More than 100 years of history swirls around the Indianapolis 500, and the race’s iconic drivers and machines will be saluted on Legends Day presented by Firestone on Saturday, May 25. Featuring autograph sessions with current and past drivers, historic car laps and live concerts with some of the biggest stars in country music. The Snake Pit presented by Coors Light is the ultimate festival of fun, friends and some of the biggest electronic music acts in the world. The Snake Pit is the perfect start of a sizzling summer, and you know you don’t want to miss it. Find out who will lead the field of 33 for the 103rd Running of the Indianapolis 500 presented by Gainbridge by joining us during Crown Royal Armed Forces Qualifying May 18-19 at the Indianapolis Motor Speedway. Saturday and Sunday will feature exciting on-track action from some of the best and fastest drivers in the world. Enjoy a day at IMS and witness all of the work and preparation that goes into starting for "The Greatest Spectacle in Racing." Bring your friends and family out to see their favorite Indy car drivers prepare for the Indy 500. Kids age 15 and under are free with a paid adult ticketholder! Take in the full race weekend experience by staying within our various camping locations throughout the outside of the Indianapolis Motor Speedway. Featuring options for every type of fan, enjoy the race all weekend-long. Join us Saturday for a morning of autograph sessions, memorabilia show and drivers meeting for Legends Day presented by Firestone. This does not include Firestone Legends Day Concert admission. Enhance your experience by reserving your Race Day electronics today. Immerse yourself in all of the action that includes live audio from the drivers, crews, broadcasts, track officials and more! 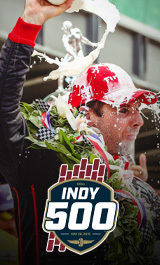 Continue the magic of the 103rd Running of the Indianapolis 500 presented by Gainbridge during the annual Victory Celebration which will take place on Monday, May 27, at the JW Marriott Indianapolis. IMS Ticket Exchange Media & News! Get the Gear!